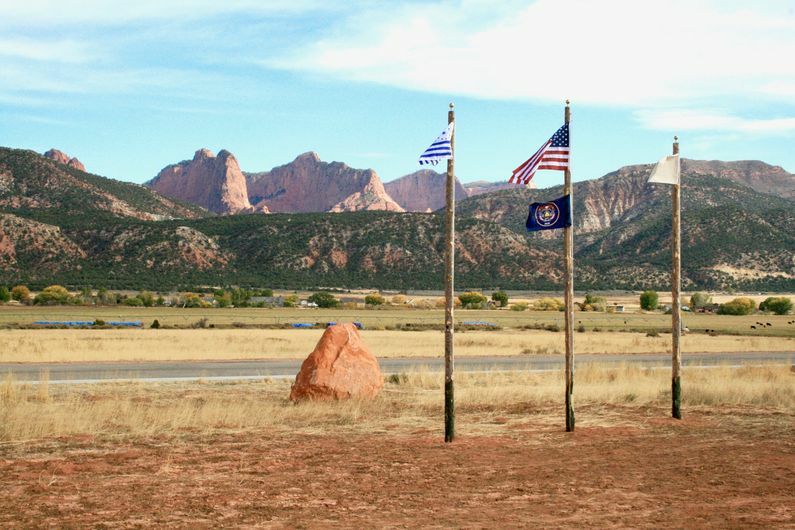 Fort Harmony (1854-1862) - First established by Mormon pioneers 20 May 1854 at the direction of Brigham Young. Abandoned in 1862 after heavy rain and snow destroyed the adobe structure. 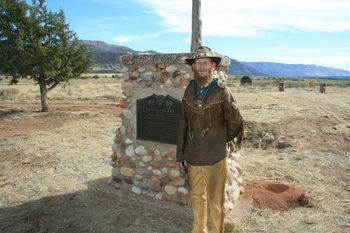 Fort Harmony Marker and James Lee, 4th Generation Descendant of John Lee. Established by Mormon pioneers 20 May 1854 as a trading post and way station. The corners were marked by Brigham Young and construction was completed in February 1855 under the supervision of John D. Lee. The fort was built of adobe and local rock in a 200' square. The east side contained single story buildings against a 10' wall while the west side had two story buildings against a 16' wall. There were gates on both the north and south walls. 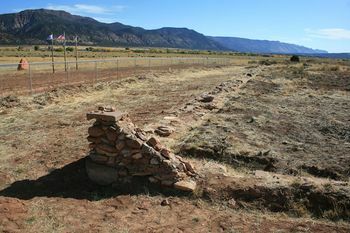 During the lifetime of the fort, it served as the county seat of Washington County, Utah Territory (1856-1859) and was the headquarters for the Southern Indian Mission. In 1862 a prolonged period of rain and snow compromised the adobe fort and the settlers were forced to abandon the site when the structures began to collapse from flood waters. The refugees move to the present day towns of New Harmony and Kanarrville. The site of Fort Harmony was donated to Washington County in 2006. The site has been partially excavated exposing the rock foundations and some significant artifacts. A community effort is underway to further recover and restore what remains of the fort. Location: East of New Harmony, Washington County, Utah. This page was last modified 10:07, 17 March 2019 by Bill Thayer. Based on work by John Stanton.